This talk will introduce a new generic model to incentivize cooperation between parties that are engaged in the paradox of a social dilemma. The proposed protocol uses social network structures to incentivize cooperation. Collaborative links are formed between individuals that are motivated by selfish behaviour: according to the simple criterion that ‘individuals seek to interact with others at least as cooperative as themselves’ (direct reciprocity). These trusted relationships are then used to prioritise the choice of peers to interact with. The protocol is designed for direct application to a number of services such as resource sharing, content dissemination and micro-blogging. The second part of the talk will briefly present some of results previously obtained and discuss possible mechanisms for adaptation in dynamic environments. The model has been validated through a prisoner’s dilemma based simulation modified to represent realistic content sharing scenario by using similarity of interest between peers to define payoff. Agents may adaptively change their cooperation levels when forming social relationships by copying those of the most ‘popular’ members of their own social groups. This has a beneficial effect on the cooperation level of the whole population while free riders and uncooperative nodes result heavily affected and ostracized from interaction. Dr Gualtiero (Walter) Colombo is a Research Associate at Cardiff University. He there obtained an Msc in Computing in 2005 and a PhD in Computer Science in 2009 from the same institution. His interests include the design of intelligent systems for different types of networks. 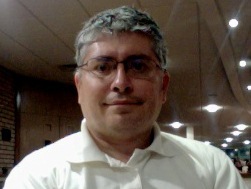 He has a background in Engineering and Computing (Meta-Heuristics) and is experienced in interdisciplinary research. He has recently been involved in an EU project for the application of social networking techniques to pervasive wireless environments (SOCIALNETS). He is currently working on another EU project RECOGNITION, concerning new approaches inspired from human cognition for embedding self-awareness in ICT systems.